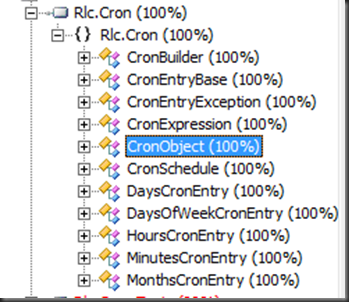 In this post, I will explore a C# implementation of a cron enabled object. Quartz.NET – This is a very complete cron job library. By far it has the most features. In fact I wanted something less complex. NCrontab – This is a simpler library that implements a cron scheduler (no cron job). I almost used this library, however decided to add the extra burden of rolling my own scheduler. Mostly to put myself in a better position to maintain and extend this code going forward. In the end, my implementation of the cron scheduler is loosely based off of the NCrontab library. I give credit to that group for inspiring this design. I have added original work in adapting the the cron objects & API to how I want to use the cron, adding cron expression tooling that allows schedules to be built programmatically, and developing an event based cron object. // Create the cron schedule. // Create the data context for the cron object. // Create the cron object. // Start the cron job. First, a cron schedule is created. 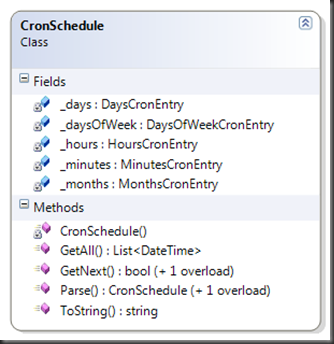 The cron schedule in the above example will trigger at the top and bottom of every hour (every 30 minutes). 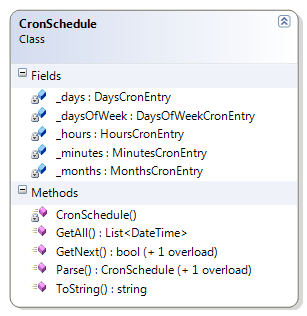 Multiple cron schedules can be attached to a job by adding them to the list. 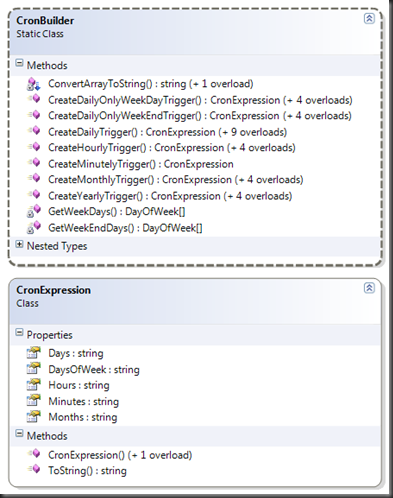 The ‘CronBuilder’ tooling allows cron expression to be created without the underlying knowledge of the cron expression format. For example, in the above case the equivalent cron expression is “0,30 * * * *” or “*/30 * * * *”. I find it much easier to let the tooling create the expressions. There is more info below on cron expressions. Next the data context is instantiated and properties are set. The ‘Object’ property holds a reference to the job object. As you will see, this object is provided back to you when the cron triggers. In addition the ‘LastTrigger’ date constrains the search space for the next cron trigger. In an application, this is date will usually be persisted to allow for restarts. The cron object is then created and events are registered. In this case, only the ‘OnCronTrigger’ event is subscribed to. There are other events (more later) that can be subscribed to by the application. 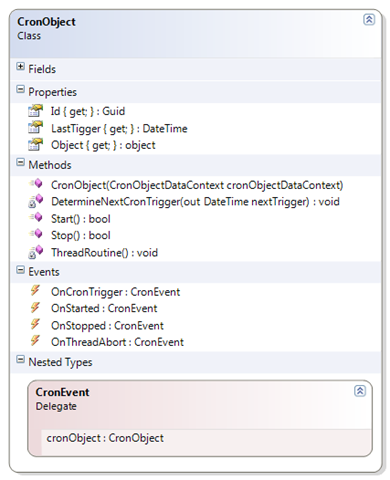 Here we see that the event provides us with full access to the original CronObject. As a result, I simply cast the object I passed into the data context back into the original type. Then I can call methods (in this case call the ‘Run’ method) on that object. Entry #1 – Filters the minutes (0-59) that are allowed to generate a trigger. Entry #2 – Filters the hours (0-23). Entry #3 – Filters the days (1-31). Entry #4 – Filters the months (1-12). Entry #5 – Filters the days of the week (0-6, 0=Sunday). “*” – Any valid value can cause a trigger. The validity of the values is checked to ensure that the resulting date / time exists. For example the day of the month is checked against the current month & year to ensure it is a valid day (including leap years). “3” – Only a single digit (in this case a three) can cause a trigger. “0,30” – A list of digits (in this case a zero and a thirty) can cause a trigger. “1-10” – A range of digits (in this case the numbers 1 through 10). “*/2” – Only even digits in the valid range. “0-30/10” – Only 0,10,20,30 will cause triggers. “0 * * * *” – Triggered at the top of every hour. “0 0 * * *” – Triggered at 12 AM every day. “0 0 1 * *” – Triggered at 12 AM the 1st of every month. “0 0 1 1 *” – Triggered at 12 AM the 1st of January of every year. “0 0 1 1 0” – Triggered at 12 AM the 1st of January when it falls on a Sunday. “*/30 * * * *” – Triggered at the top and bottom of the hour. “0 0 */2 * *” – Triggered every other day at 12 AM. “0 3 * * 6” – Triggered at 3 AM every Saturday. As you can see these expressions are powerful. With a bit of tooling (see below) they become easier (IMO) to write. An instance of the ‘CronSchedule’ encapsulates the details of evaluating the cron expression and determines the next trigger date/time. This object has a private constructor and is instantiated by using overloaded ‘Parse’ methods. 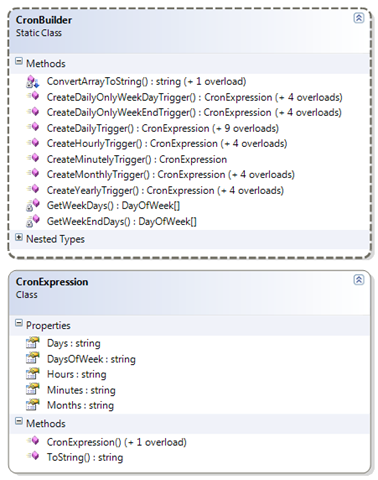 The ‘Parse’ methods simply take a cron expression as a parameter. The ‘GetNext’ and ‘GetAll’ methods generate the next date / time that is a trigger for the cron expression. The private members contain instances of entry objects that help determine the next value based upon an entry filter. I am not going to go into the details of the code to determine the next cron trigger. The algorithm is similar to the algorithms used in other cron libraries. The source code is provided so the interested reader can dig in. It helps me to visualize the algorithm as a date/time odometer with a spinning wheels for year, month, day, hour and minute (shown left to right below). Each wheel has the allowed values which are filtered from all possible values by applying the cron expression. The algorithm starts at one minute beyond the last triggered date/time. It then ‘spins’ the minute until the next valid minute is found. If it wraps around to the beginning of the list, the hour element is incremented. Then the hour element is ‘spun’ to find the next valid minute. This process continues. Validation is embedded in the code to ensure that the month, day, year combination results in a valid day (accounting for months having different number of days…including leap year). Although the cron expressions are powerful, I find using them directly first starts with me finding my cheat sheet reminding me of the format. I created some tooling to help with this effort. This method creates a cron expression for a trigger that occurs daily at the provided list of hours and only on the days of the week provided. This object is simply a class with a bunch of properties that define the inputs that are important to the ‘CronObject’ class. This allows the CTOR to remain simple (one parameter) even as the injected dependency list may continue to grow. The data context above has three properties. CronSchedules – This is a list of ‘CronSchedule’ objects. Each job can have multiple triggers. For instance you can have a hourly trigger during the week days and a twice a day trigger for week end days. LastTrigger – This is the last time the job was triggered. This allows you to restart a cron job without past cron dates being re-triggered. Object – This object is represents your job. It can be an instance of any class. This object is accessible at as a parameter from any event that is raised by the ‘CronObject’ class. This could be an object that implements an IRunnable interface for example. As shown above, the ‘CronObject’ communicates to consumers via events. Probably the most important event is the ‘OnCronTrigger’ event that is raised when ever the current date/time matches the next cron trigger date/time. // Can't start if already started. //    outside the thread pool. // Raise the started event. // Can't stop if not started. // Wait for the thread to join. // Raise the thread abort event. // Raise the stopped event. The code is pretty simple. Even though these methods are called in the same thread, synchronization is used to prevent a new call from occurring before the other has finished. That could lead to some issues where the object state is half baked. Notice that the ‘Start’ method spins up a new ‘System.Thread’ to perform the cron work. 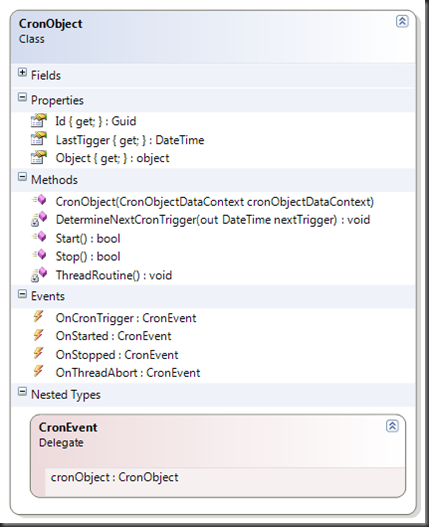 The thread routine that does the cron job work of raising the ‘OnCronTrigger’ event is shown below. It uses an ‘EventWaitHandle’ object to allow the thread to pause until the next cron trigger. This object is also used in the above ‘Stop’ method to wake up the thread so it can be stopped. // Continue until stop is requested. // Next trigger is in the past. Trigger the right away. // Update the last trigger time. First the next trigger date/time is determined. This may occur in the past and in this case the ‘OnCronTrigger’ event is raised immediately. Otherwise, the thread sleeps until the next trigger. After the ‘OnCronTrigger’ event is raised, the ‘LastTrigger’ property is updated. This can be used in the ‘OnStopped’ event to serialize out this date for restarts. This simply loops over all the cron schedules to determine the next trigger. There is a suite of automated unit tests in the project. Test coverage is 100% (see NCoverExplorer screen shot below) at this point and I believe test quality is high. Here again, a big nod to the NCrontab group. I had a number of tests that I had generated for the cron expression cases and this was supplemented by adding the NCrontab test cases. Being able to schedule a process or job to occur on a periodic basis is a very common development task. This library provides a clean and easy way to accomplish this behavior. Please feel free to download and use. If you have suggestions for improvements I will attempt to maintain. Waited for years to find an article. Thanks for posting this. Will try to implement it. when the timespan.Miliseconds is larger than Int32.MaxValue(=2147483647, which is about 25 days). Apparently my test cases didn’t cover this size of a delay. The solution provided looks like a good solution. It should be noted that the solution caps the maximum cron to int32.maxvalue. Hi Bob, first of all thanks for the great software!! I also run into the same Problem as yucel. But on my System the exception is triggered whenever the timespan is longer than about two minutes. Actually I’m not 100% sure why, but I’m using some Special ARM Computers so I guess they even use less than 32bit for an int. First of all nice article. I need to know if their is a way to get the last time the schedule had triggered before some datetime value. Is it possible? Actually the problem is i need to manage an event which has a starttime cron expression and an endtime cron expression. Now when ever the application is started, it first should check that if the current time is greater than the lastendtime (this is what i need) and also the current time is greater than the laststarttime AND the lastendtime should be greater than the laststarttime. If it is then it should be in the event action phase. It should do what it should because the current time is valid between the two time window. But if it is not then it wont do anything but wait for the next starttime. This will require some custom code. I would start by looking at the ‘DetermineNextCronTrigger’ method in the ‘CronObject’ class. You can probably extract this out of this class and provide a delegate to allow a custom implementation. Any way, that is where I would start. OK i found that i can use Quartz.NET for this. I just wanted to parse Cron Expressions and determine the schedule times that is why i found your library more intrusive. But then i found that the expressions you are using are not matching the Quartz.NET implementation, actually i am working on another open source project of mine, So i dont want to confuse the configurator user to use another type of expression. Your library just differed from Quratz.NET in the way it is parsing Cron expressions. Any ways i like the simplicity of your lightweight library. Glad you found something that works for you. After all, that is what it is all about! Hi, Is there any way to have a GUI for the schedule details and generate the Cron expression dynamically. Sure. That is not in this code, you would have to develop that or find one. Thanks for the cron expression syntax explanation. I find myself back to this page every time I need to create a new cron syntax. I have cron syntaks “0 18 * * 5”, but I don’t want it to trigger first time when I declare CronObject. How can I solve this? I added a variable bool ExecuteNow = false; to my Class that I use to call the CronObject. Then I added a variable DateTime BaseDateTime. The return value of this variable is dependent upon the ExecuteNow value. If the value of ExecuteNow is false, then the BaseDateTime is DateTime.Now. If it is true, then BaseDateTime is DateTime.MinVal. 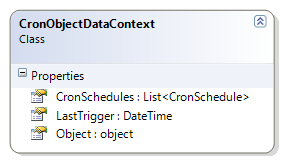 Then I set the CronObjectDataContext.LastTrigger to BaseDateTime before calling new CronObject(CronObjectDataContext). This will allow you to control the initial firing of the event. So far love the class. I tried Quartz but the process stops when there is no traffic for 20 minutes. Does cron runs like windows service irrespective of IIS time outs ? This article is provides a .net class that you can use to create a windows service. I sometimes have what I call ‘service URLs’ that I configure the crontab daemon (equivalent to windows task/schedule manager) to call. Otherwise, if you have an active site you can use site visits to trigger the background work. This is what WordPress does for example. great tool. But how can I schedule a trigger for ‘every last day in month’? Is this possible? As far as I understand, when a task is started, the CronObject starts a thread that continually checks the time and if the time matches the trigger then it runs the OnTrigger event? Doesn’t this mean that each task has its own thread for checking the time whereas it would be more efficient to have just one thread checking the time and running each task when the time is right? This way additional threads are only started when the task is scheduled to run, rather than taking up resources all the time. This saved me a lot of time when converting an iCal RRULE, which I parsed using DDay.iCal, to a crontab schedule. After a good few hours searching and getting frustrated I happened apon your library and love it. More people should know about your cronbuilder class. This causes the job to fire a few seconds late (fine), but also i’ve seen it fire up to 30 seconds early. This causes the job to run twice on the day, as the next trigger is set and it is all but 30 seconds away. I’m guessing some kind of clock issue on the computer – Any thoughts on a more stable approach? I have a job that checks to see if certain files are in a folder, and if they are then they get processed. I need the job to check if they are their every couple of hours, but once they have been processed, I do not need it to run again for that day. Is there a way to accomplish this?